The culture around feed sack fabrics really inspired me to create something that would highlight the various levels of design and craft that emerged from this commodity. Many of these fabrics were reused by women as a means to create garments for themselves and their families. With so many families reclaiming these fabrics, companies caught on and began to dye the fabrics and print beautiful patterns. Some fabrics were even printed with embroidery guides for objects likes dolls. In addition to this element of renewal and craft, I was also struck by the language and graphic design used on the feed sack labels. For the design on my binding, I chose to recreate a paper label through hand embroidery. This label is wrapped around an authentic feed sack fabric. Bound as a 3-Part Bradel binding. The spine is covered in handmade Katie MacGregor paper in purple. Boards are covered in vintage fabric with a hand embroidered Japanese tissue wrapper. Embroidered with cotton floss. Red leather wrapped endbands. Endpapers are handmade Katie MacGregor paper in aqua and Hook Pottery paper in pale pink. Woven through the history of the feed sack are ideas that are often of less value or prevalence in the 21st century… frugality, resourcefulness, conservancy, economy, and preservation. Feed sacks served a function, while also bringing beauty and design into the home. 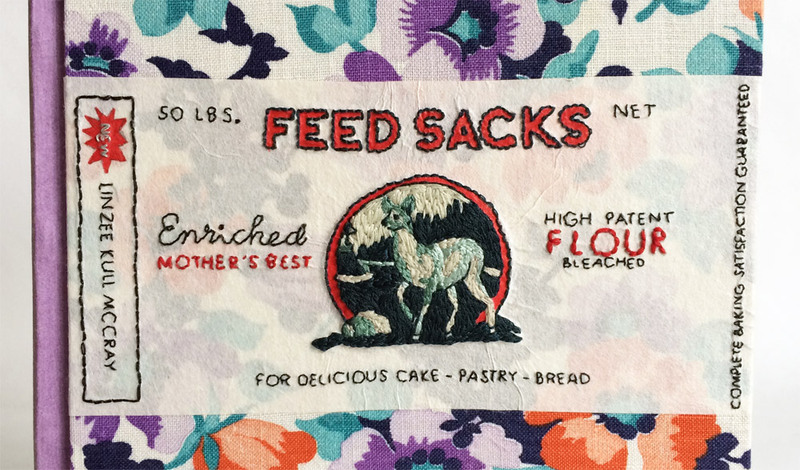 In designing my cover for Feed Sacks, I wanted to give a nod to the many ways in which these lovely, practical materials were used and reused and used again. 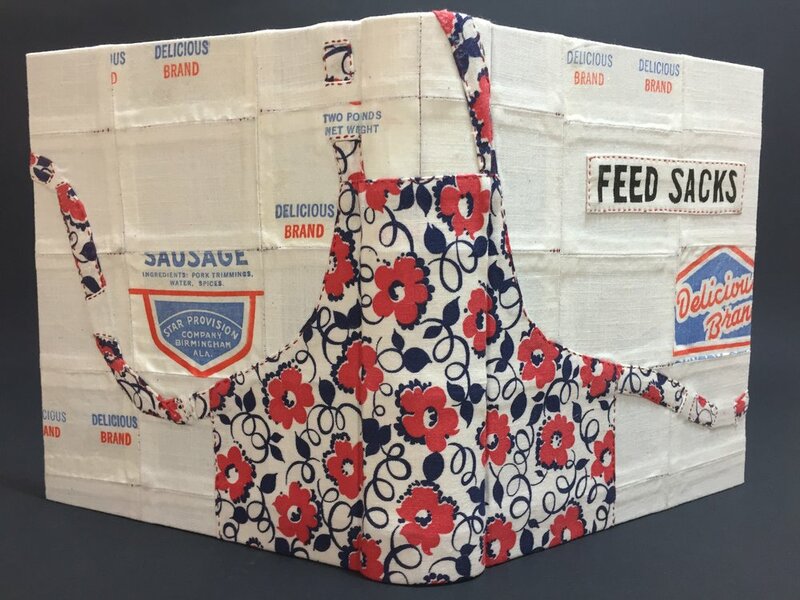 Once emptied of their original contents, feed sacks were sewn into aprons or dresses. Scraps were used to make curtains or quilts. Even thread was recycled and reused to sew new household items. In my binding, I repurposed a scrap of a feed sack to make the endsheets, endbands, and the apron that weaves through the cover. The quilt in the background is pieced together using a cotton broadcloth and pieces of feed sack cloth from a sausage manufacturer, Delicious Brand. For the title, I cut a linoleum block and printed it in black ink on broadcloth, which I then sewed onto the cover using reclaimed red thread from the Delicious Brand feed sack. See more on the Feed Sacks Bindings project website. 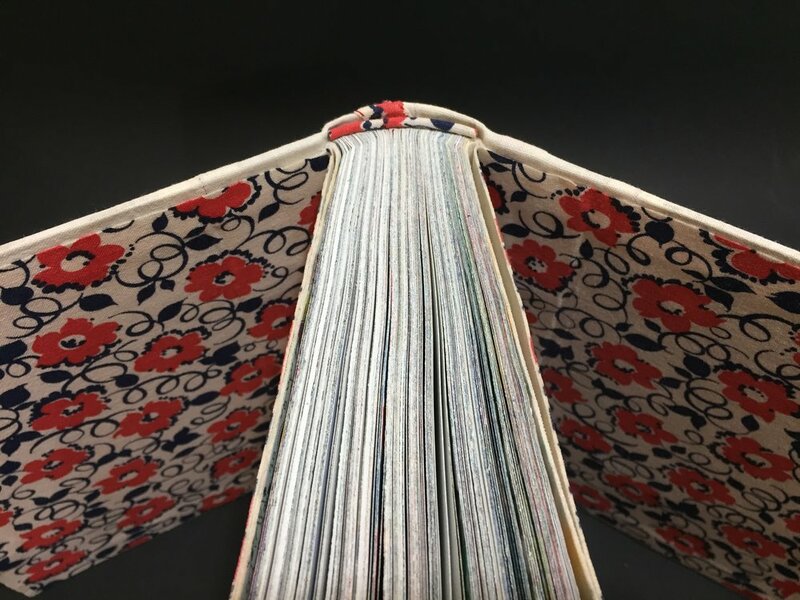 The specially bound Feed Sacks books will be on display at the Iowa Quilt Museum next year as part of a Feed Sacks exhibition curated by Linzee Kull McCray. The Feed Sacks book can be purchased from my webshop and I have a few limited edition books packaged in a contemporary dress-print sack. 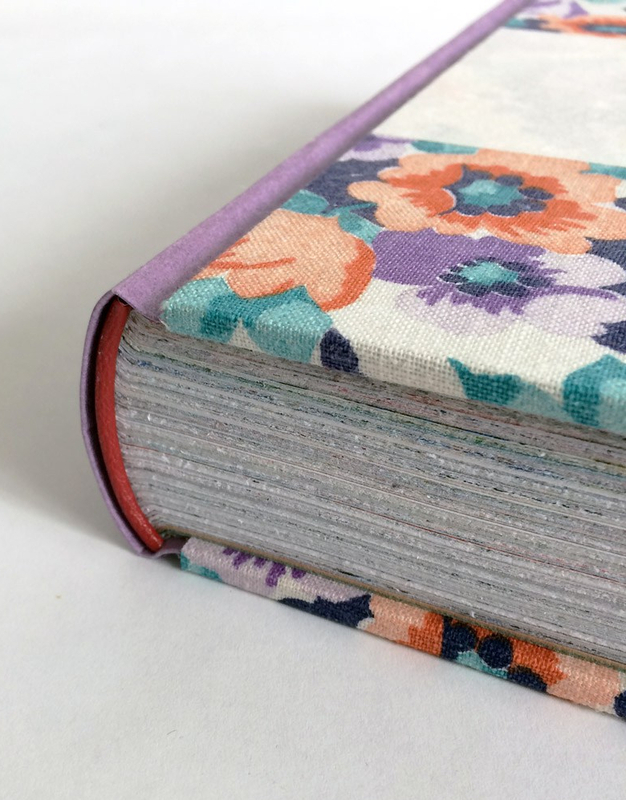 Perhaps you'll be inspired to sew your own special fabric cover for the book!